Commenter Ariela shares her experiences as a nursing mother of five. 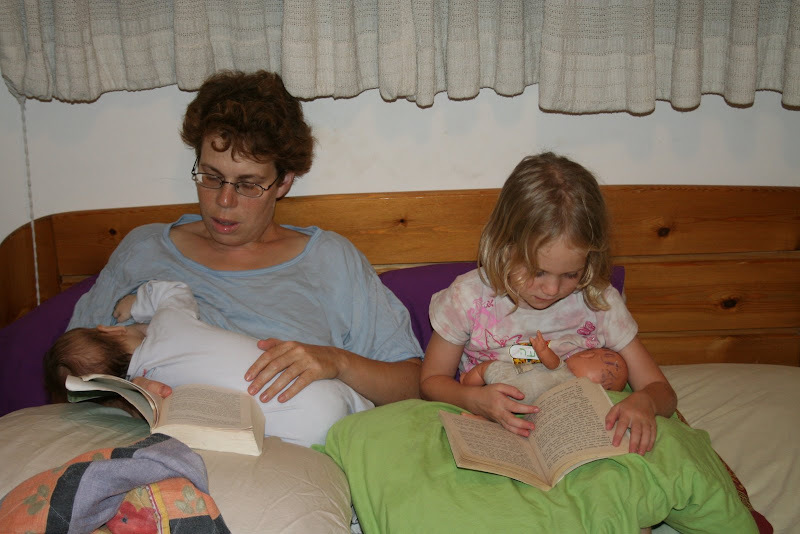 This is a picture of me and my daughter Noa nursing our babies. I am combining two of my greatest pleasures, reading and breastfeeding. One of the things I love about breastfeeding it that it “allows” a busy mother of 5 to take a few minutes “off” to sit down and read. I have had the privilege of breastfeeding 5 children. I did this while working full-time. I am writing to tell other women about my experience and give hope to others trying to combine work and exclusive breastfeeding. Some of my solutions are expensive. However, baby formula is also expensive. Moreover, breastfed babies are healthier; this means that you will need to take fewer sick days and that will save you money as well. Before I had my firstborn (he is 15), I knew that I wanted to breastfeed him. I was also aware that my financial reality dictated that I return to work after 3- 4 months. I desperately looked for books or support groups on the topic, but found almost nothing. My sister already had a child and exclusively breastfed her while doing her PhD, so I looked to her as my guru. She expressed breastmilk by hand, so that is what I would do as well. I was starting my PhD when my son was born and was able to stay home with him for four months. When I returned to work I hand expressed milk between classes in the rare women’s bathrooms at Hebrew University. The surroundings were unpleasant (to say the least) and there were usually people waiting outside for me to finish. You can imagine how relaxing and conducive to lactation this environment was! Nevertheless, I expressed milk for 10 months and he never had formula. We had a wonderful breastfeeding relationship until he was 13 months old. This was not easy: I had to do “makeup” milk expression sessions on the weekends and always felt like I was barely making it. I also developed tendonitis in my right hand. When my daughter came along I learned a bit and bought an electric breast-pump. It was battery-operated and did one side at a time. This was better than hand expression, because it gave me a free hand to do things like eat while I expressed milk (and did not give me tendonitis). Double-tasking is essential for a working mother! I also convinced an attending physician at the department to let me use her office to express milk. The surroundings were more relaxing and I was able to express sufficient milk, but not enough to avoid the weekend “makeup” sessions. I expressed milk until she turned 10 months and she breastfed for 13 months. After my third child was born I did two helpful things: I bought higher grade of pump and I started expressing milk when he was 4 weeks old. I expressed about 100 ml everyday and froze them so that I would have a backup supply of milk. This was fantastic for many reasons, most of all because having a backup supply ensured that I never felt pressured to produce milk. Of course, as in all performance anxiety, when the pressure was off I produced more milk. Also, pumping both sides stimulated my letdown so I got more milk than ever. There were no more weekend pumping sessions and I always had enough milk. I did use all the milk produced on my maternity leave, so I was not pumping as much as he needed, but we were OK. However, when he was 9 months old I got a killer breast infection and decided to stop pumping. He nursed for 16 months. When Noa (see the picture) was two-and-a-half months old we moved to Seattle so my husband and I could do post-doctoral research. I schlepped my pump to America and started pumping and storing breast milk as soon as we landed. To my delight and surprise I found that the University of Washington has many lactation rooms. They are private, quiet rooms that provide hospital-grade breast-pumps. Each mother is required to buy adaptors and all pump parts that come into contact with her breasts. I had a long talk with the lactation consultant at the center about the pump-in-style vs. the hospital strength pump in the lactation room and she convinced me to try their pump. I was hesitant because I loved my pump and had schlepped it across the ocean and a continent. All I can say is OMG — there is no comparison between that one and the hospital-grade pump. I was always able to pump more than enough milk and never had to use the supply sitting in my freezer. I am sure the lactation room also contributed to my successful pumping. I had never felt truly comfortable in borrowed office. The lactation room had a cork board for pictures of babies, a place to wash hands and pump parts and was very comfortable. I pumped milk for Noa until she turned 13 months and breastfed her for two and a half years. I currently nurse my 20-month-old son Ehud. I also have an academic position and an office of my own. When he was born I rented a hospital-grade pump from a local lactation consultant whose name I got from the Israeli distributor. The pump cost me 190 NIS/month and I figure that is less than formula. I did pump and store a supply of breast milk while on maternity leave, but much of it is still clogging up my freezer. I pumped milk for him in my comfortable office and was able to talk on the phone and work on the computer while pumping. I stopped pumping at around a years. I plan to continue our nursing relationship as long as it works for both of us. For me at least, the better the pump, the more milk I produced. Some women prefer to manually express breast milk. The big disadvantage of this method is both your hands are in use and you cannot multi-task. Even the double-sided breastpumps leave you with a free hand. No matter what method you use, relax, look at a picture of your baby and think about her. It helps the letdown reflex. Make sure the sitter understands the differences between breastmilk and formula. She should also try to arrange that she feeds the baby your milk a few hours before you come to pick him up. [That might be too long for some babies.] That way, baby is hungry and ready to nurse when you show up. Nothing annoyed me more than coming to pick up a baby and find that she is just finishing off a bottle of my liquid gold and has no interest in me. Thank you, Ariela, for sharing your valuable experience with us. I’m looking forward to readers’ suggestions. Dear MIL – your comments really enhance the post – thank you. While #7 may be the best piece of advise, in my experience it is the most difficult to actually do. In Israel (and Seattle) it is almost impossible to find a good babysitter exactly where you need her. Thank you. I think that people want the convenience of not having to shlep the baby a long distance–some babies hate travelling–and having other family members bring or collect him. great post! I love the picture too – very cute. Ariella you’ve also given your kids such a good example too – I reckon they won’t question at all whether they or their wives will breastfeed when they have kids. I think this is so important – there often just doesn’t seem to be a breastfeeding culture – so many women don’t have any positive examples and have to figure it out on their own. I decided to put my son into a tinokia on my campus which meant I could go and feed him if necessary. This proved invaluable when due to poor milk management I ended up with no freezer reserves at all. It’s one of the reasons I am still breastfeeding him. It also meant no paying for a commute, and since I wasn’t happy having him at the tinokia for longer than 8 hours, I could get at much work done as possible. The only hassle was those days when I was exhausted and wanted to drop him off, but needed to go home and sleep (luckily I have a flexible schedule which allows this), but then it was a complete shlep to bring him to the tinokia on the other side of town. There are good arguments once they’re a bit older for having them in a day care close to home. The other reason is of course my Medela Lactina – rented for 160 shekels a month, and my double pumping set. Thank goodness for the lactation consultant’s husband (ha) who told me I should try double pumping – SUCH a time saver! I also refrigerate the set between sessions so I don’t have to wash it – works well and saves on hassle. Another tip is once baby is old enough to eat, if you can’t pump enough rather have them eat a bit more solids than they should, rather than stopping breastfeeding altogether. Then any extra milk you pump you can use to build up freezer reserves again for emergencies. Katherine – thank you for your postitive feedback. Your advise is very good as well. It sounds like you had a positive experience working and breastfeeding as well. I agree that older children are better off closer to home. It’s also less practical when you have older children. I breastfed my oldest daughter because I felt it was best not because I wanted to, but I was surprised by how much I enjoyed the experience. I took a maternity leave of 4 months and during that time went out and bought the most expensive and up-do-date pump (it was a medela, don’t remember the specifics), determined to give her almost breast milk. But I hated pumping. The human body is an amazing thing. In the end I realized that my daughter had totally adjusted to my work schedule; I nursed her when I was home and babysitter gave her a formula when she was there. She got 2 bottles and 3-4 nursing feedings a day. On weekends I had to stick to the same schedule otherwise I leaked on Mondays at work. I did this with all three of my daughters. It’s not purist, but it worked well for us. Women don’t always realize that giving formula while they are at work is an option, and think they have to wean completely. It does make it harder to keep up a milk supply over the long term, and going so many hours without pumping can lead to engorgement and infection. There is a theory that women who leak are less prone to those infections. Baila, good for you! If you are able to combine breastfeeding at home and formula while you are at work, its fantastic. However, for many women this results in their milk supply drying up. Others give formula while they are work and exclusively breastfeed over the weekend. Although some women get engorgement from this. I believe that each woman needs to find what works for her and for her baby. The most important thing is that we are supportive of one another’s choices. I’m blown away by the office story. When we remodelled the department where I work, I insisted on adding a special lactation room. We have many students with small baby’s, and I did not want them to have to nurse in the bathroom. Yesterday to my horror, I found a faculty member giving an exam in the room while a poor young mother ran around with her baby looking for a place to nurse him. I am going to write a nasty email to all the staff about htis! I second MILs comment about the Spectra pump. The Spectra 2 is simliar to the madella lactina (I used both). Although yad Sarah rent it out, I bought mine for aroudn 600 shekels which is clearly worth it, also with a neat travel bag. Double-sided pumping is the way to go too, both saving time and being more effective. There is a yahoo email list called pumpmoms with excellent advice especially for working moms. Also important is that your babysitter should know how to give a nursing baby a bottle, so the experience is as similar as possible to nursing; e.g. not to stuff it down their throat, but to gently offer, and not for force them to finish it, but very much to follow baby cues. (lots of material about this on the Kellymom site) There is a specific way the bottle should be held (parralel to the floor). Always use the smallest teat on the bottle (and more). Sitters not experienced with mothers milk also are not familiar with the amounts of milk a nursing baby requires, which are different from the amounts of formula needed, so may try to give too much milk. Pumping has now become very common in Israel and if you read hebrew it is worth joining one of the Israeli internet support forums, or English, the list I mentioned. Keren, thank you for the great information! Here in the US, Medela has a wonderful pump called the Symphony. It’s quiet, battery-operated (optional), lightweight, and variable speed/strength. I preferred it to renting the Lactina or Classic, and I was pumping for a micro-preemie. Hospital grade double pumps are definitely the gold standard when it comes right down to it. The Pump-In-Style, while good, is just not in the same league. I know I’m a bit late to the party here, but I wanted to add my two cents. While I think your article is great and stresses a lot of great points, I think it would be helpful if you mentioned more explicitly that a lower/lack of milk supply can occur for a multitude of reasons, not simply because a woman doesn’t get sufficient rest. Medications, medical conditions, anatomical issues can all affect milk supply. I can tell you from my own personal experience that I was diagnosed with PCOS prior to my first pregnancy. It is well known that many women with PCOS have difficulty with milk supply. Even with herbs, a lactation consultant (who specialized in PCOS), a double Ameda-Agnell Lact-e pump (hospital grade pump), an office to pump in, and co-sleeping I simply couldn’t produce enough to feed my child adequately. I nursed her (and she got formula to supplement) until she was 11 months old and I got pregnant with my second child. Shortly after my second child was born, I was feeling exceptionally tired (I did have a newborn and an 18 month old). I went to the doctor expecting to be diagnosed with a low thyroid, but was surprised to find out I had Grave’s disease (over-active thyroid). Once I was put on medication to treat it my milk supply shot up (the endocrinologist gave a long explanation as to why; it was almost five years ago I don’t remember the details). It still wasn’t enough to adequately provide her with her nutritional needs. I nursed her for 13 months and supplemented with formula. Barbara – thank you for the pumprecommendation. I am not sure if it is available in Israel. I agree that the hospital stegnth pumps are a league better than PIS. AidelMeidel – thank you for pointing out that there are objective physiological reasons for not having enough milk. It always is a good idea to consult with a physician (who knows something about breastfeeding). It sounds like you made tremendous efforts and did a great job with your children despite being sick. Good for you! Keren and Barbara, thanks for sharing your experience with various pumps. The Mamash center, mentioned in the post, would know about the situation in Israel. Aidel Maidel, I echo Ariela’s comment. By the way stress can become a physical issue when it interferes with the let-down reflex. This is a bigger problem for pumping mothers who don’t have the baby to help the reflex along. Hence the suggestion of the picture in the lactation room, etc. Actually, there’s no medical evidence that women with PCOS have a low milk supply. I have PCOS and have always had a great milk supply. Milk supply does have physilogical factors, but I’m not an MD so I don’t presume to be an expert as to the matter. Also, Ariela is not a medical doctor, so it’s a bit silly for you to expect her to mention ALL of the reasons for a low milk supply. I think the point of the article is to let women know that they have a choice to breastfeed and work at the same time, not to be diagnostic. I used the Medela pump in style with my first and second child, and was pleased with the results. I rented out the Spectra from Yad Sarah, and found it very painful with less than optimal results. The problem with the advice that to wait till 6 weeks to introduce a bottle is that very often the baby will be then old enough to refuse a bottle. Rest is very important to breastfeeding. I can tell you on nights when I sleep less I have less milk. Anothing thing I found is that the progesterone only pill completely dried up my milk. I had to switch to another form of BC since it wasn’t worth not being able to breastfeed. I know that it’s not SUPPOSED to do that, but it did that for me. I think it’s amazing Ariela that you pumped at the bathbrooms of Hebrew U. That’s crazy that they provide no facilities for nursing at such a large public institution. I myself have pumped in the car on numerous occasions, even while driving! The thing that I find most sad is that women think that they have to stop breastfeeding when they go back to work. Ayala – you are the greatest. I have heard from several women that the progesterone only pill dries up their milk, even though it is not “supposed to”. MIL – could you write a post on contraception and breastfeeding? Please note I did not say ALL women with PCOS, I said MANY women with PCOS experience a low milk supply. And while I’m also not a MD, there are plenty of PCOS specialists who acknowledge while there are currently no studies, there is plenty of anecdotal evidence from patients and lactation consultants showing that there is evidence of this situation. I also did not expect her to mention ALL the reasons for a low milk supply, but her writing style clearly gives off the impression that if you have a milk supply problem it’s cause is because of external factors like stress, fatigue, anxiety, etc. i.e. “it’s all in your head”. There are many reasons why a woman might have low milk supply and I think it IS important to state (like Ariella mentions in a later comment) that if you are having supply issue you should consult with a lactation consultant and/or physician. To Ayala and Aidel Maidel: The post could be read to imply that if only a mother tries hard enough, she’ll have enough milk. And for AM and many others, that’s just not true. I first read it in the context of a mother with a full supply who goes out to work and has trouble keeping up the pumping, but when I reread it I understood AM’s comment. my daughter (16) and i like the picture! she used to do the same thing….very cute! Thank you Tikva – I love the picture as well – glad your daughter likes it. It is great to give children a super positive attitude about BF. What a wonderful picture!! It exemplifies what great modeling you are doing for your kids. I think your post, including MIL’s comments, is very informative and encouraging for the average working mother. Thank you for your positive thoughts RivkA. I LOVE your blog and read it everyday, although seldom comment. I randomly found you via a google search and love your articles! EzratNashim.com was launched just for bloggers like you (and features a babysitter directory). Please join and get your friends to follow to help create Israel’s first online community for English speaking women living in Israel. Thanks! P.S. You can submit articles on EzratNashim for everyone to read as well, kinda like a public blog. i just want to commend you. This is a wonderful write up and i think is worth many women reading. i make sure a lot others read it. Ezrat, good luck with your project.